Blast From the Past | T.O.T.E. I love photos. I mean, I really love photos. I get lost for hours looking through photo albums. If I visit your home, the first thing I’ll be distracted by is photographs you have on display. There’s something magical about capturing a singular moment, and in that moment, an entire memory. So, instead of washing the dishes or doing the laundry today I was browsing the thousands of photos I have stored on my computer. Looking at each photo awakened my other senses and I remembered tastes, smells, feelings, sounds…Most of the photos are from 2005 and beyond, which in the grand scheme of things isn’t that long, and I’m shocked by how much my life has changed. These photos sit on my hard drive (and an external hard drive, and on a CD in our fire safe, and on a CD in Julie and Bob’s fire safe, and in cloud storage…Andy is nothing if not prepared) waiting to be browsed and used. What better use than to share them with you? So, every once in a while, I’ll post a blast from the past. It will remind me (and you) of what we were doing at this date throughout the years. I hope to some day scan all of my mother’s photos too. Then I’ll really have some oldies but goodies to share. Don’t we look like babies? 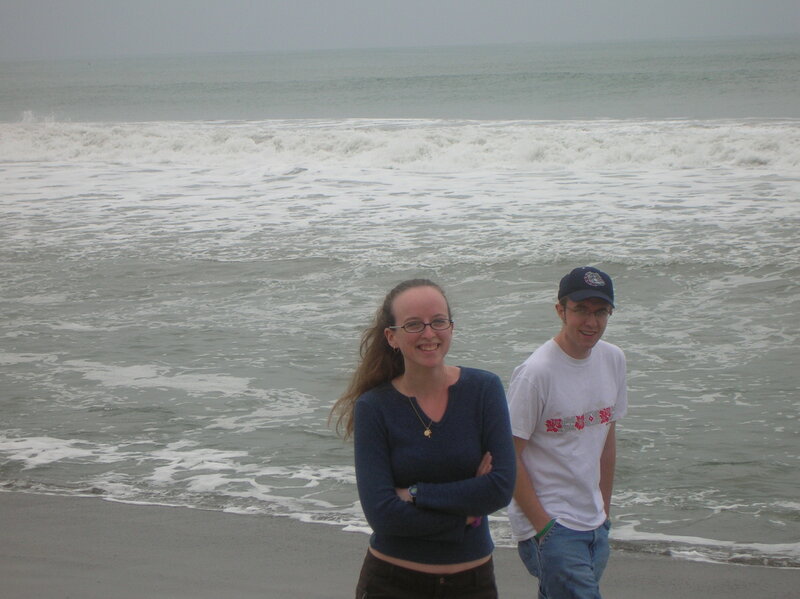 I think we had been dating for a whopping year and a half by this point. Andy’s grandparents graciously invited us two lovebirds down to CA to spend our Spring Break having a blast with them! They took us to Universal Studios, and Sea World and a million other fantastic places. More than the places though, I remember spending time getting to know Grandma Frances and Grandpa Bob (or Great-Grandma and Grandpa as they’re known now). It was wonderful to get to know these two grandparents who mean so much to my husband. They are beautiful people with generous souls. Disney Land!! Our first family vacation in a long, long time. Jess, Cor, before you complain that this is not a very good photo, let me ask you a question. 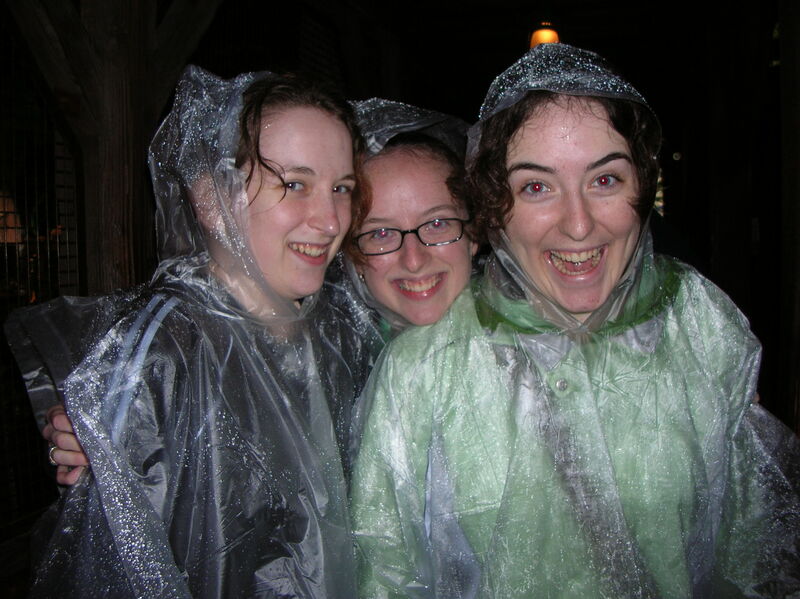 Do you know how hard it is to find a photo of the three of us where one of us is not goofy? I’ll just tell you: it’s very difficult. So, this one will have to do. Anyway, we grew up singing Disney songs at the top of our lungs. Don’t believe me? I dare you to spend 5 minutes around my family (well, my mom, sisters and I…Dad’s not one for belting show tunes) without someone quoting, singing, humming a song from Mulan, Beauty and the Beast, or Aladdin. It’s in our blood. I swear our little red blood cells swim along merrily singing Hi Ho, Hi Ho, It’s off to work we go. So, obviously, this was truly a magical vacation for us all. Even though it rained, and I was grumpy because I got cold. Cold is my enemy. My Jafar. My Sher Khan. My Evil Stepmother. My…well, you get it. Good thing I have two grounded sisters who can snap me out of even the deepest pity party. We’re in Disney Land, for goodness sake! Not the best photo from Brazil, but one of my favorites. Andy and I helped install a gravity shower in a small village that hopes to receive some eco-tourists (and by helped, I mean we bought the supplies and then watched an amazing community work together for a day to build it). Some foreigners can be a little funny about taking bucket baths. 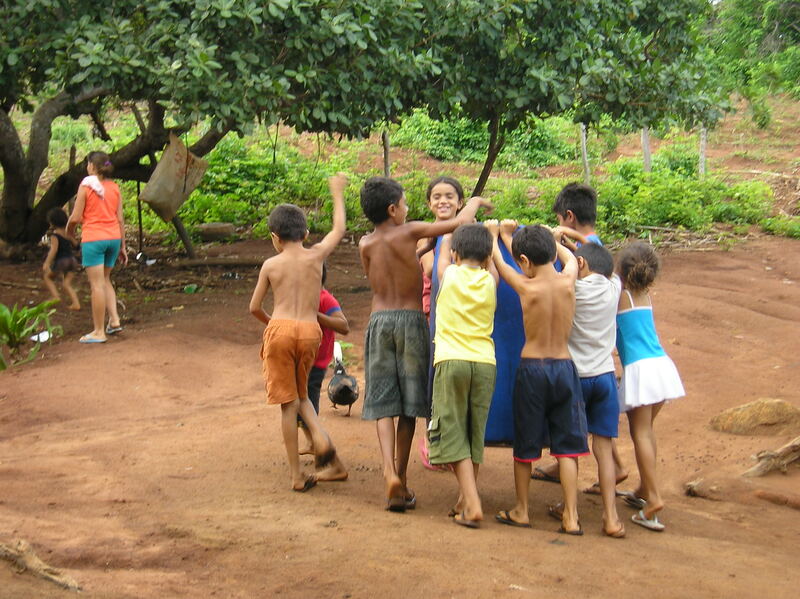 These little kids marched the barrel away to be washed chanting “Formiginhas!” Little Ants. They couldn’t lift the barrel individually, so they took a cue from nature and worked together. Man, Brazil has some serious ants…serious bugs all around (this is a facebook album Andy and I kept of all the creepy crawlies we saw while there). This however, is one of my most favorite photos. I can’t even remember his name…and that makes me a little sad. 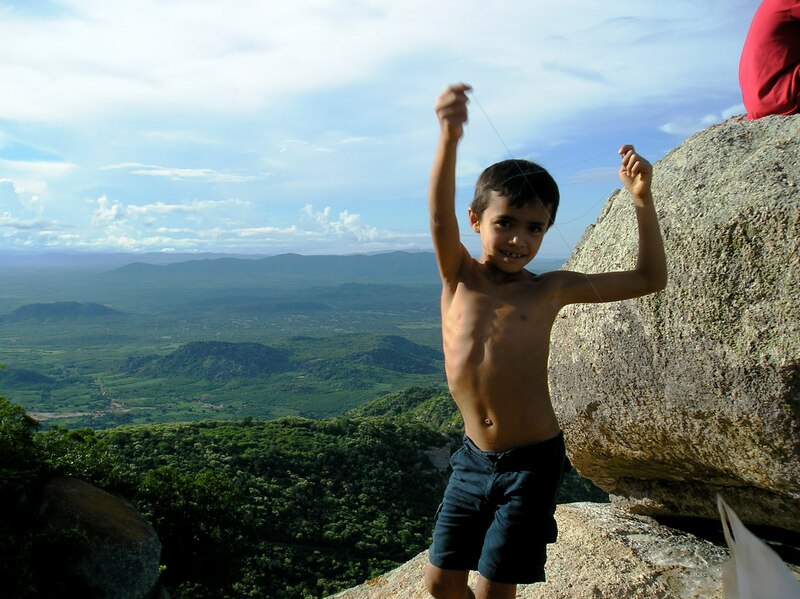 But I do remember how proud he was to make his little kite out of floss and a plastic bag, and how brave I thought he was to climb all over that rock to fly it high above the Brazilian wilderness. 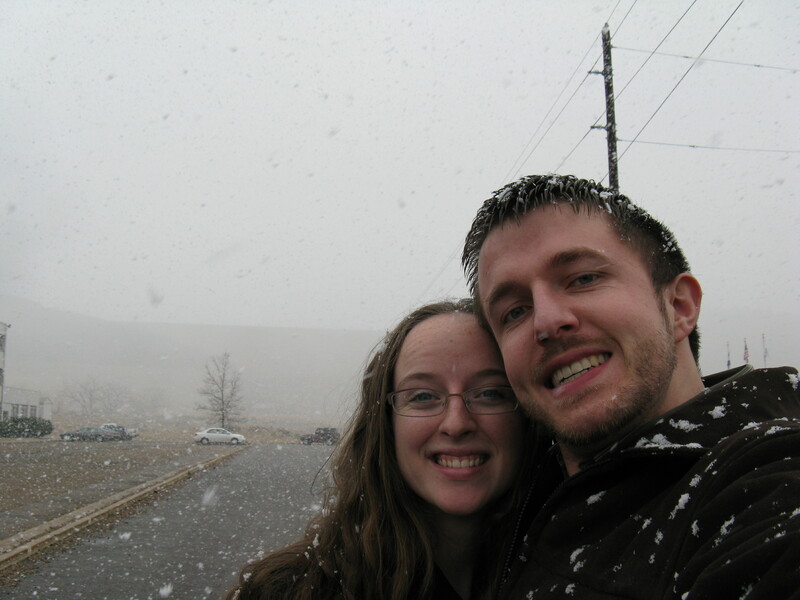 Andy and I caught in a snow storm in Fort Collins while touring CSU. Our decision to choose Utah over Colorado for Andy’s graduate studies was difficult. What if we had gone to CO? Would we have made friends? Would I have an RN? Would Mo exist? Would Andy have a job now? What ifs are easy to obsess about, and we must trust that everything happened just the way it was supposed to. Not to mention, Utah faculty and students are much better at wining and dining potential graduate students. At least in the bio-engineering department. We made great friends, and we sorely miss the community we built in Logan. So, a long time ago, someone (who will remain unnamed) backed into the rear driver side door of the green Honda Accord my mom drove, rendering it useless. 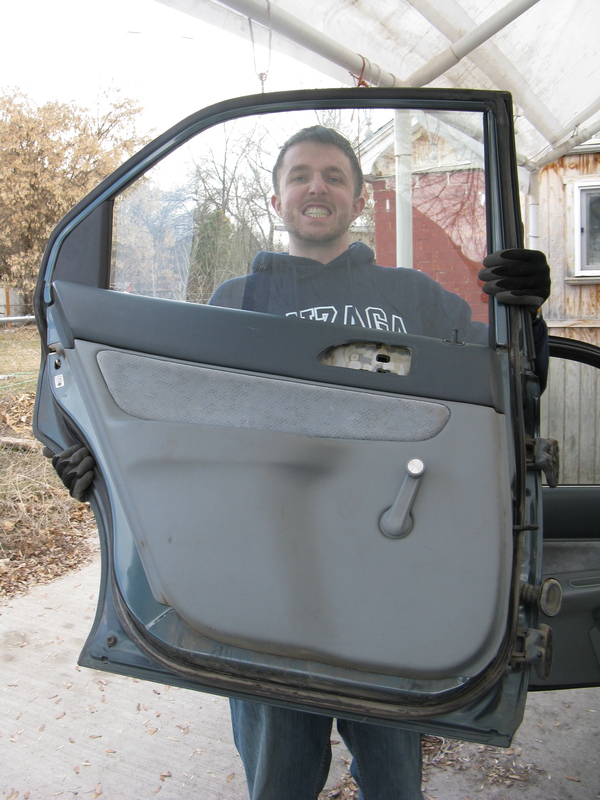 It remained that way for many a year, and (after inheriting the car for college) it became part of my ride-giving ritual to tell people “Oh, that door doesn’t work. You’ll have to go around.” Friends got used to it, and we all lived happily with 3 doors for a long time. Until Mo made an appearance. We decided 4 doors would be the best option, what with a baby and all. So Julie and Bob helped us snag a new-to-us shiny (silver) door from a junk yard. Andy and Bob performed the successful operation. And I am happy to say that the door works great. Now, however, we are those people. You know, the ones with a door that’s a different color than the rest of the car. Yeah…we’re cool. We know it. And, we finally make it to last year. Oh my goodness, how Mo-bug has changed. Here she’s being a huge help with the laundry. It’s funny, cause now I can say she actually does help. She’ll transfer clothes to the dryer. She’ll carry clean clothes to the couch. 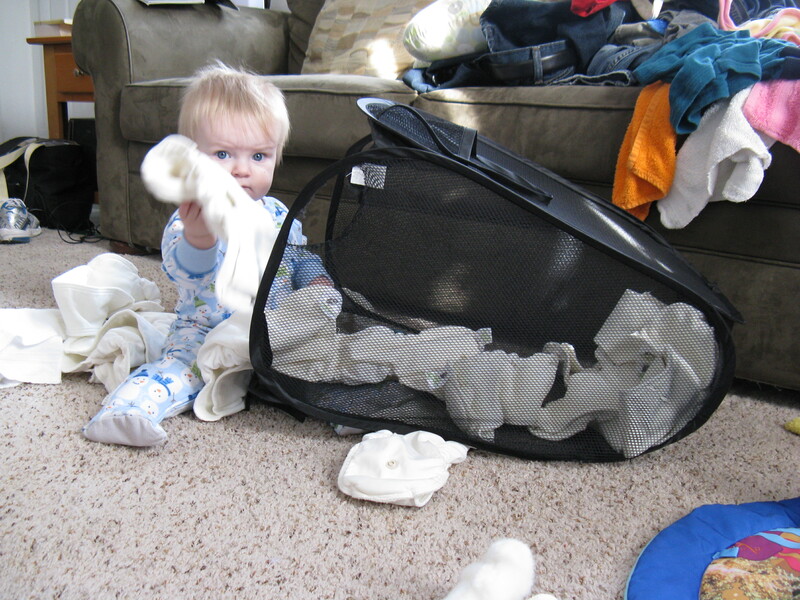 March 2013 we’ll have another little girl who may (or may not) look a lot like this little girl, probably “helping” me in much the same way, as I wash the same cloth diapers. But that’s looking to the future, and this post is about the past. Thanks for taking this trip down memory lane with me. I promise they won’t all be this long…well, hopefully not. Next time maybe I’ll let the whole A picture is worth 1000 words thing work for me, cause I’m running out of words. Thank goodness for photographs. Caitlin, this was awesome. Thank you for sharing so many intimate thoughts and precious moments!